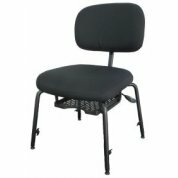 Black Cat Music offers a wide range of music chairs, music stools, chair storage carts and accessories. We offer high-quality chairs that encourage good posture and long-term comfort. For more information about any of our chairs, stools and other products, please Contact Us or give us a call on 01892 619719. Fully adjustable orchestra chair with upholstered seat and music storage rack.